We also own a neighbouring vineyard in the Bordeaux Appelation. 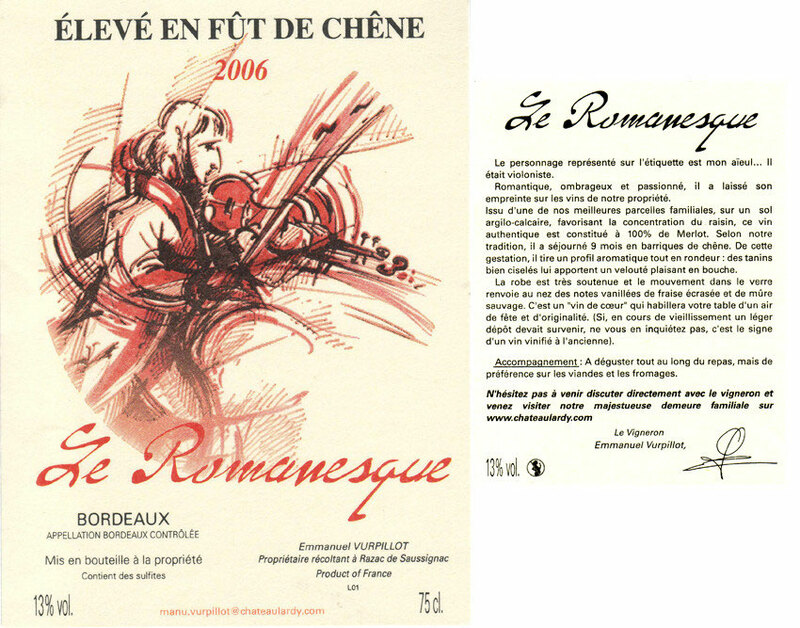 In memory of my other great-grandfather, who was a violinist in the New-York conservatory, we have given the wine the name “Romanesque”, which comes with a beautifully designed label. Light and delicate like an artist’s touch, this wine could symbolize our family. (I myself am fond of music, making my own arrangements, and writing and singing with my group Manujubile, which is quite successful in the Périgord.) I invite you to sample this music along with a sip of “Romanesque”. This wine come from soil which contains more silt and clay than the “Lardy”. We call this in french a “boulbène”. The subsoil is cooler and gives the wine a lighter colour than the Bergerac. With any meat or fresh rindless cream cheese. The “Romanesque” is being matured in oak barrels. Its 13 degrees of alcohol and the smoothness of its tannins herald and amazing wine. It is already great, one of the best wines we have seen in a long time.